The Verve Shading Challenge is going on since last Friday, but I still cannot let go of W2. After what seemed to be a rocky start, I think this is going to be one of my favorite tangles. 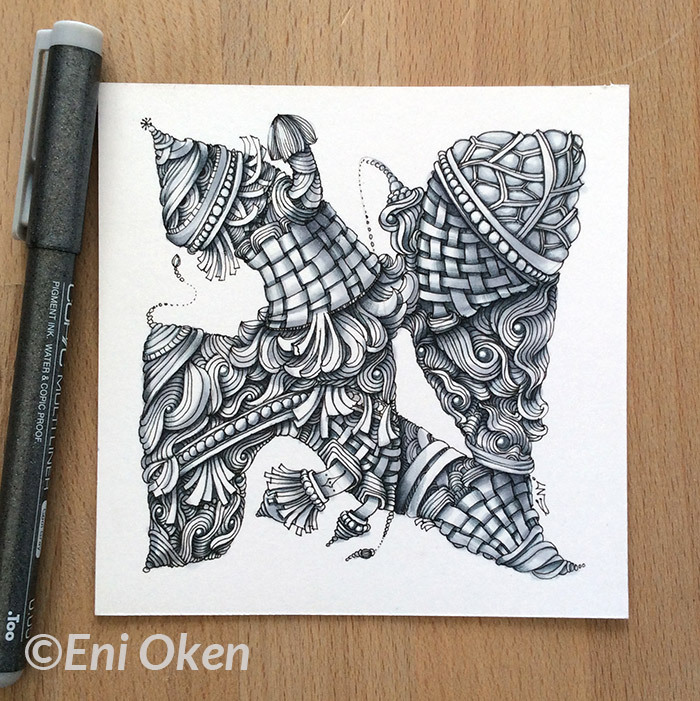 See my entry for last week's W2 Shading Challenge here. I had in mind to try shading WITHOUT using graphite pencils, only grey markers and my new found love Copic 0.1mm GREY fineliners. You can see some Verve tangle creeping in on the sides, but I never really gave it proper attention. I will probably do another proper one for Verve, from what I see, I KNOW that I'm going to fall in love with it! Here is the final tile, with full shading! Tangles: W2, Verve, Fat paper, Narwal, Molecular Windfarm, rows of pearls and Zentwining. I created this tile using absolutely no graphite pencil. The grey fineliners gave me the precision to really get into those crevices and corners for a dramatic and contrasting effect. I love it! Black and grey ink and markers over Bristol smooth paper, 4.5 inch tile.